SS wedge wire screen water stainer filter nozzle for water treatment is an ideal solution for applications with heavy amounts of media whose weight could compromise the integrity of unsupported screens. That’s because nozzles are affixed to durable steel plates that can withstand great loads without damage. Using the nozzle method gives you the reliability you want with the flow rate you require. HUADONG manufactures nozzles using a variety of materials to ensure long life and reliable performance. The non-plugging, continuous slot design makes Huadong nozzles ideal for applications that involve the retention of sand, activated carbon, ion exchange resin and more. They withhold the media while allowing the treated liquid to pass through. V-shaped wire around the plate water cap for chemical industry is made up of stainles steel or Hastelloy C wedge wire screen. It use in the water softening treatment equipment, replace Polypropylene(PP) filter. The world-class team create the first-class products,from made in China to created by China, Huadong Screen has been always the firm participant. We insist that ”20% employees engage in research while 20% of the profit invested in development” to support innovation. Right now, we have got several patents and stand up the engineer technology center for micron slot screen, owning the research and development team with high technical level. And also the enterprise will never and ever stop the new product development and equipment improvement, because we believe that innovation is the core for the enterprise. 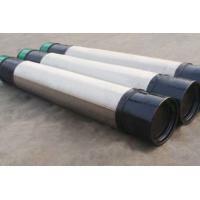 Right now, the new product drilling pipe screen and Johnson micron screen are going to be on the global market rapidly.